A Moscow woman is attempting to continue the legacy of her dead son by producing grandchildren he will never see. But Russia’s surrogacy law, known as most liberal in Europe, is placing obstacles in the way. Artyom was 19 when he died of Hodgkin’s lymphoma, an aggressive type of cancer. Before chemotherapy, doctors suggested he freeze some of his sperm, in case the treatment led to infertility. After he died, his mother Natalya knew there was still a chance to continue his genetic legacy. She decided to hire a surrogate mother to bear the embryo made from her son’s sperm and a donor’s egg. 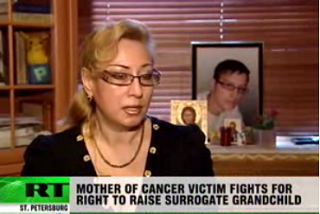 That was when she entered the murky waters of Russia’s surrogacy laws. Originally posted on February 13, 2010. -- Published in 1997, this book is a step-by-step guide to surrogate parenting. It discusses finding and working with a surrogate, what a surrogate program provides, what to include in the contracts, recommended testing for potential surrogates, detailed costs for each item related to surrogacy, the medical procedure, medications and their side effects, embryo cryo-preservation, demographics of surrogates and surrogate couples and the effects of surrogacy upon children. One chapter outlines the laws in U.S. states and in Israel, South Africa, Canada, the United Kingdom, Denmark, Germany, France, Switzerland, New Zealand, Australia, Hong Kong, Japan and Russia. Jewish law also is discussed, along with the views of several Christian denominations and other religions regarding surrogacy.